MDR are happy to announce another successful planning application. 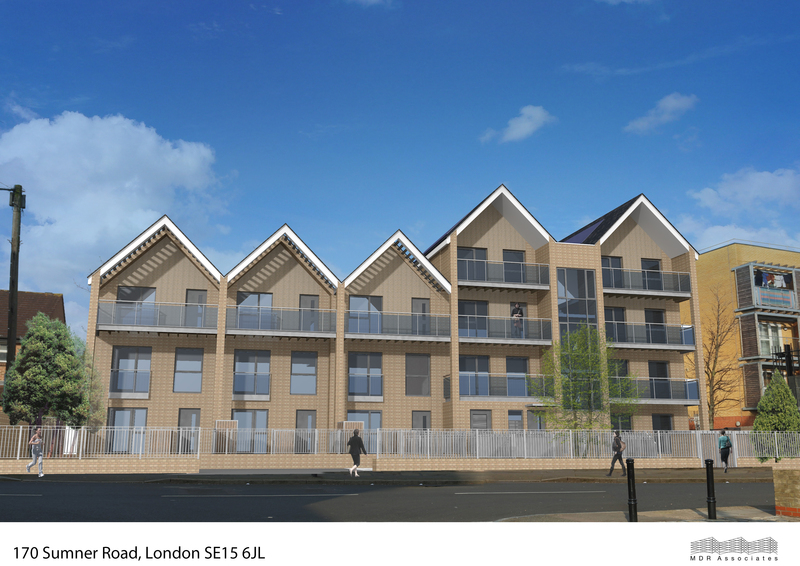 Southwark Council recently granted full planning permission for an exciting residential scheme located on Sumner Road, Peckham. The proposal, consisting of 14 residential units, utilises a vacant, ex- council office block, to create a high quality residential development in Central Peckham. Careful consideration has been given to landscape design, material selection, car reduction and cycle storage. Renewable energy will be sourced via photovoltaic panelling and Sustainable Urban Drainage System (SUDS) to provide a scheme that reaches CfSH level 4. Being located on a primarily residential road, the scheme aimed to provide an aesthetic enhancement to the surrounding area, whilst being respectful to the neighbouring Grade II listed St. Luke’s Anglican School. The scheme has been successful in delivering a modern, medium density terraced building solution, reflected by the swift and thorough planning decision that adds to our impeccable planning history with Southwark Council.